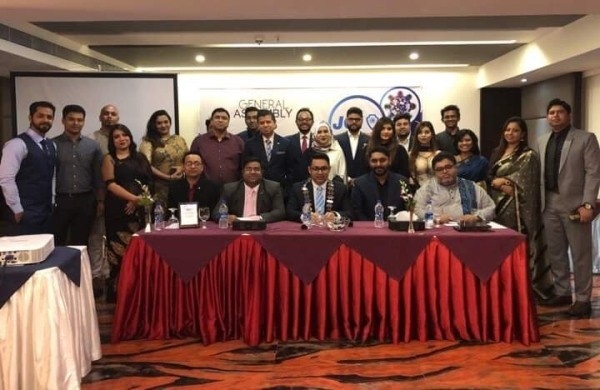 Junior Chambers International (JCI) Bangladesh organised the 2018 General Assembly (GA) on October, 19, 2018 at Long Beach Suites Dhaka, where the Executive Committee of 2019 was declared, a press release said. Local president for 2018 Jamil Uddin Bhuyian, along with National Governing Board of JCI Bangladesh & Members of JCI Dhaka United conducted the General Assembly. Khadiza Akter Sumy & Ishrat Sultana were elected as 2019 Local President & 2019 Local Vice President respectively. Local President Jamil Uddin Bhuiyan handed over the duties to Khadiza Akter Sumy, the president-elect of 2019, the press release said. JCI Dhaka United also selected Benazir Rahman as Secretary General, Tasneem Huq as General Legal Council, Faisal Habib Roni as Local Treasurer, Sharmin Hossain, Raihan Khandker and Tanim Nazmul as Local directors and Iffat Ara as Committee Chairperson for 2019. With the concern of all members, Local President Jamil Uddin Bhuiyan have discussed and presented the yearlong projects, treasurer's report of 2018 to the National governing body of JCI Bangladesh. Fayaz Atiqul Islam - 2018 National President of JCI Bangladesh, Sakib Ahmed - 2018 National Vice President of JCI Bangladesh delivered their valuable keynote address. The formal part of the assembly ended with vote of thanks given by the Local President of 2018 Jamil Uddin Bhuiyan.